Student peers are often the best resources for students to turn to when seeking to navigate the collegiate experience. Collected here are some of the resources students at GBC and elsewhere have created to advise their peers in succeeding in college. One the largest hurdles first-time college students face is quickly developing time-management skills that allow them to adequately balance study time, a social life, and employment. The GBC Student Government Association has included for a number of years a frank discussion of the necessity of developing good time-management practices and advice on how to do so. 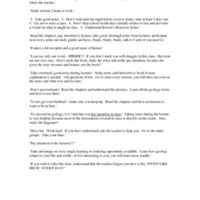 Included here is a pdf file of the advice and the associated worksheets for students to use. A number of GBC faculty use an "Advice to Future Students in This Course" assignment as a wrap-up at the end the semester, allowing students to give peer advice to future students. Here is a small collection of these advice assignments. At the end of each semester I ask students (in an online discussion) to write their advice for class success to students who will be in the class the next semester. I copy their responses into a document. Then, at the beginning of the next semester's class, I post a document full of advice from previous students for current students to read. 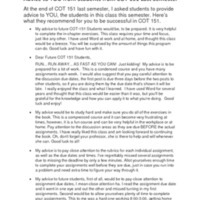 The advice document I post includes comments from numerous sections/semesters of the class; I edit to include the most useful content, but all the content is student-generated. The current students appreciate advice for class success from other students, and they enjoy being the ones giving advice at the end of the semester. This is a great thing to do in any class in any discipline. Studying is an intensely personal activity, and not everyone studies the same way--nor necessarily the same way for every subject. Identifying the environment in which individual students study best--time, place, background, tools--should be one of students' major learning projects in college. There are, however, some commonalities in bad study techniques. Students at Washington State University put together this YouTube video in 2009 discussing some of the issues involved in studying at the collegiate level. I have used this video as an optional student resource since 2013 within a WebCampus page on "Collegiate Study Skills."